All natural ornamental fungicide for your lawn and garden. A natural product that is chemical-free and good for the environment, Garlic GP Ornamental* controls white powdery mildew, rust and downey mildew. 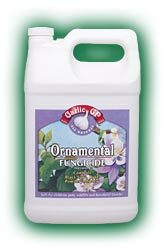 For use on all ornamentals - both inside and outdoor - Garlic GP Ornamental will not harm people, pets, birds, wildlife or beneficial insects. The application becomes odorless within hours, and lasts for up to an impressive 21 days! Green shrubs, blooming shrubs, trees, ferns, conifers, tropicals, succulents, palms, bedding plants, vining plants.